If you just found this post from its title and you need a book for dad, for a dad who likes Hunting, or Fishing, or Dogs or Birds of Prey you're done, Steve B's book will remind the old man of a few favorites, and leave him wanting to order a few of Steve's favorites. It's a witty book, and as the recommendations of each of the 100 books have amusing and insightful anecdotes about the authors, he's bound to like it. I did. I've never met Steve Bodio but I avidly read the blog posts he writes from his Querencia in the high country of New Mexico. Hunter and naturalist, a-firearms aficionado, and the author of some very very well written books. He's the kind of guy you would ask for a book recommendation, he's read most of the cannon of outdoor literature and knew quite a few of its writers too. So the idea of asking him to put together a list of favorites was a good one. I imagine visiting him in his study, seeking a book recommendation with the background reading to put the recommendation into context, Steve's eyes light up and he turns to his groaning book shelves levers out a couple of volumes and wittily invokes their authors and environments. Done. His 'A Sportsman's Library' is that in a box. 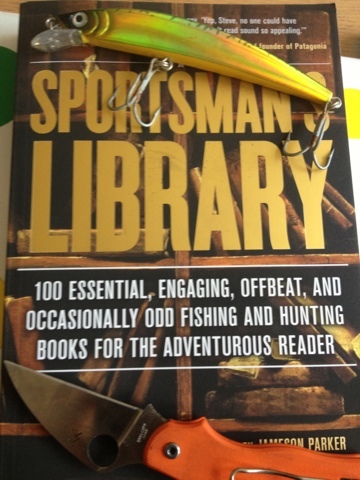 But enough of books, I'm off to flick some lures at the Pike in the canal.